Why would I need self storage in Brea, CA? There are a variety of reasons why you might need self-storage in Brea, CA. How much is a storage unit in Brea, CA? The cheapest storage unit in Brea, CA is $39.00 per month. What size storage units do you have available in Brea, CA? In Brea, CA we have sizes that range from 4'x4' to 12'x25' to suit your storage needs. How much is it for a 4'x4' storage unit in Brea, CA? The cheapest 4'x4' storage unit in Brea, CA is $39.00 per month. Brea is a vibrant city in Orange County. It's conveniently just a few miles from La Habra and Anaheim. The city has become a popular retail destination and hiking spot, and many tourists stay in Brea due to its proximity to Anaheim's theme parks. Several annual events, including Concerts in the Park, the County Fair, Brea Fest and the Brea Jazz Festival Concert Series, bring the community together. The first Spanish explorers arrived in the area that's now Brea in the late 1700s and established camps in Brea Canyon. A small village developed in the area, and a large oil drilling company bought the land in 1894. Brea was officially formed in 1911 when the neighboring villages of Olina and Randolf merged. Its name is the Spanish word for "tar," a reference to the large number of oil-drilling towers in its hills around the turn of the 20th century. When the local oil industry declined, Brea established lemon and orange groves and expanded the economy into the agricultural sector. As time passed, the city evolved into the modern-day Brea it is today, a hub of retail and tourism. The city has experienced steady population growth over the past several decades as more people discover its healthy economy and extremely low unemployment rate. The local economy continues to strengthen, with the area experiencing job growth in recent years. Brea is one of Orange County's key retail destinations thanks to its revamped downtown precinct and popular Brea Mall. The manufacturing industry is also particularly strong, and key businesses include Bristol Industries, Life Science Outsourcing and Amada America's laser manufacturing facility. 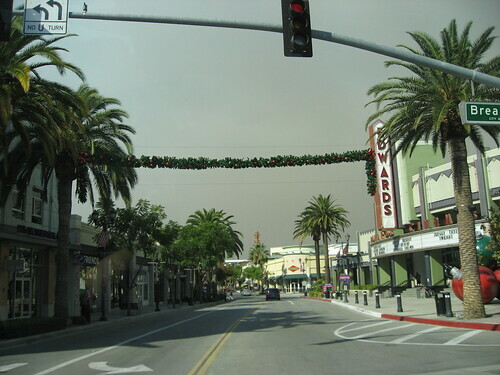 Brea's educated population is one of the key attractions for local businesses, and a large percentage of the workforce holds bachelor's degrees. Top employers in Brea include Bank of America, Mercury Insurance Group and Beckman Coulter. The Brea Olinda Unified School District oversees most public schools in Brea. Many of its schools have won academic and sporting honors, earning national recognition for student achievement. You can also enroll your child in one of Brea's private schools, with faith-based, Montessori and secular options available. Although Brea is a fairly small city, it's still home to higher education. The Southern California College of Business and Law is located in the city, as is the Southern California extension of the Golden Gate Baptist Theological Seminary. Utilities: Brea's main energy providers are Southern California Edison and Southern California Gas. The city manages water and sewer services. Garbage and Recycling: Republic Services provides curbside trash collection, and you can request bulky-item pick-up. Transportation: The Orange County Transportation Authority has several public bus routes, including express routes around the city. Brea offers a wide variety of residential areas to suit all tastes and budgets. Families may be attracted to the charming 1920s homes of the South Brea historical neighborhood or the luxurious dwellings of upscale Olinda Ranch. Modern low-maintenance loft apartments with easy access to downtown are available in South Brea and Bourke Street. Home values in Brea are on the rise and expected to continue their upward trend. Currently, the median home price in the city is significantly higher than both the state and national averages. Our lowest priced units in Brea, CA average $43.33 per month. 343 people have reserved units in Brea, CA in the past 30 days. There are 3 locations within Brea, CA's city limits. There are 2 locations in Brea, CA that offer AC and Heating features.